For me, like many others, when the sun decides to make an appearance so does the exfoliator, fake tan and razor to try and get my pasty, hairy legs looking somewhat presentable. For the rest of the year I'm usually hiding my legs under layers of clothes, but during the hotter months the hemlines get shorter and we can start to think about baring our legs to all - Cue panic and removing the dust from our once beloved gradual tanner. Today I thought I would talk to you about my favourite, must-have summer products to get your pins Summer ready. Exfoliator | A necessity in everyone's routine, but one that is especially important when you want to remove dry skin and prepare your legs for fake tanning. Lush Rub Rub Rub, a sea salt and mineral enriched body exfoliator that helps remove dead skin cells and rejuvenate the skin. If you're not a fan of coarse exfoliator, then I would recommend the Nip+Fab Circulation Fix Body Scrub, as it doesn't just gently exfoliate, it also polishes and helps minimise the appearance of cellulite - Now who wouldn't want that? Shave | Whether you choose to shave, wax or laser your leg hair, getting rid of it will never be a pleasant or an enjoyable experience. For me, I'm a slave to the razor, as soon as a hair grows back I'm there chopping away at it. I've bought and tested a fair share of razors, but nothing compares to my Gilette Venus Spa Breeze Razor when I want to achieve silky, smooth legs without the need for shaving gel. Moisturiser | I put my hands up - I'm the worst person when it comes to moisturising. I've gone weeks without even applying a drop of moisturiser to my legs. When I do remember and get into a routine, I always have the battle of narrowing down which moisturiser to use. 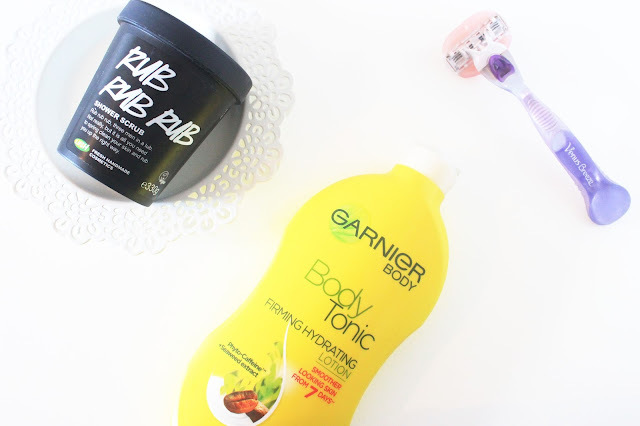 If I'm in a rush, then I always reach for the Vaseline Spray and Go Body Moisturiser, for quick application and glowing legs, but when I have time and want more intense hydration then I choose the Garnier Body Tonic Firming Hydrating Lotion. Not only does it sink into the skin in record time, it doesn't leave you feeling like you need to walk around naked for half an hour avoiding all surfaces. Why I ever forget about this one I don't know, but it works. Tanning | Even though tanning isn't for everyone, I find it's a great way to add a bit of colour to my pasty legs and make myself look healthier. The St Moriz Instant Self Tanning Lotion is one that I've used for years and I rely on it when I want a deep, natural looking tan that is quick and easier to use. Say goodbye to panic tanning. Pedicure | Pastel nails aren't made only for fingernails, so during the hotter months I opt for an array of pastel shades to decorate my feet on show. If you know me, then you'll know that Essie - Fiji and Topshop- Parma Violet are the two shades that are constantly on my toes. After a good chop, file and paint you're good to go and sandal ready. What are your favourite products to get you Summer ready? I love rub rub rub and the vaseline spray and go! It's the perfect moisturiser for lazy girls!